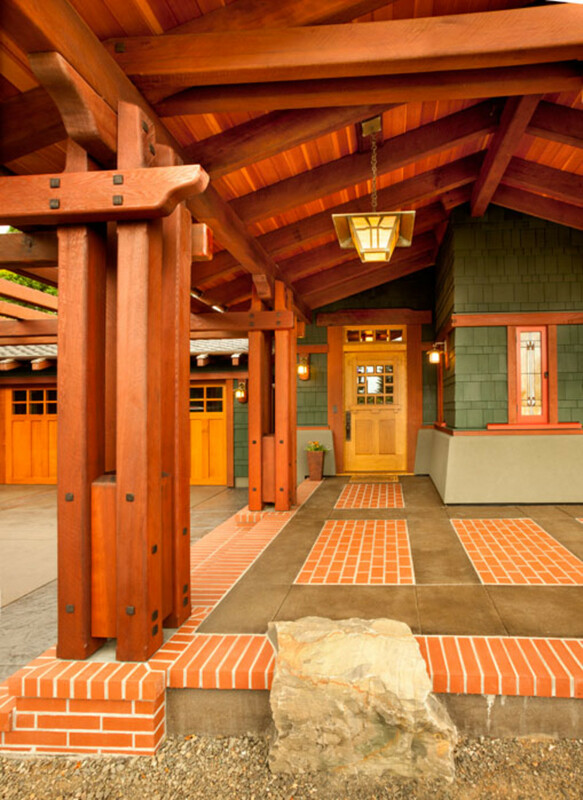 An oddball 1984 ranch is remade as a stunning California Bungalow, its woodwork details inspired by the owners’ trip to Pasadena’s most famous houses. A once-nondescript 1984 ranch is remade as a stunning California Bungalow by dedicated homeowners. 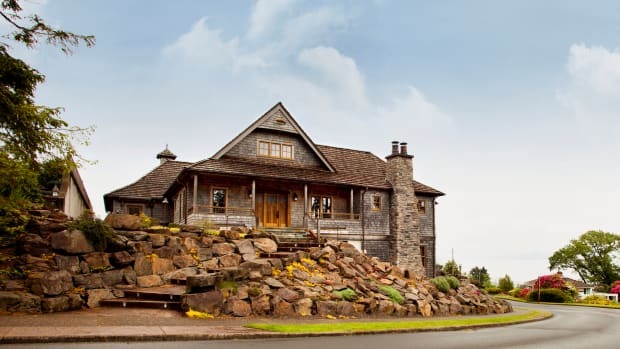 They’d finally hit the wall after 12 years in their one-storey 1984 ranch house in Dallas, Oregon. Carol and Brian Dalton say that friends, delivery people, and even family members had trouble finding the home’s invisible entrance, which was tucked behind the suburban two-car snout garage. The tipping point, however, was a buzzing fluorescent light that was driving them crazy. The ranch was transformed into a shingled, two-storey Arts & Crafts house. Intersecting angles, textures, and materials lead the eye, and visitors, toward the custom entry door. 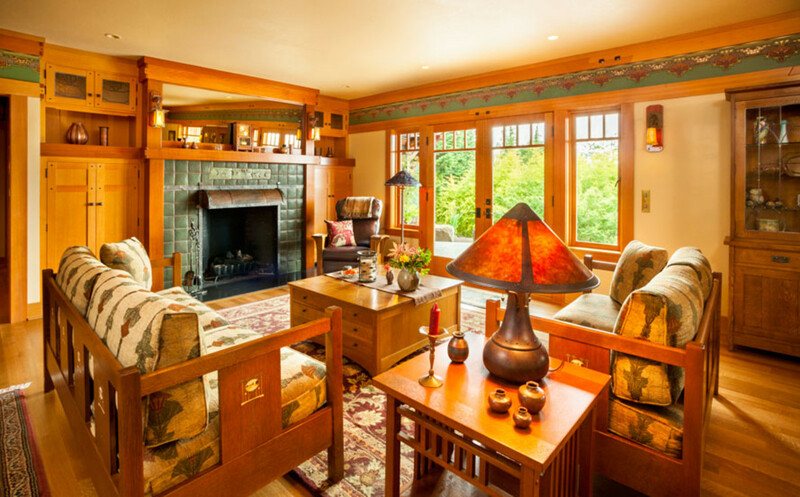 The fireplace is a revival of American Arts & Crafts design, its color echoed in Bradbury & Bradbury’s ‘Arcadia Frieze’. 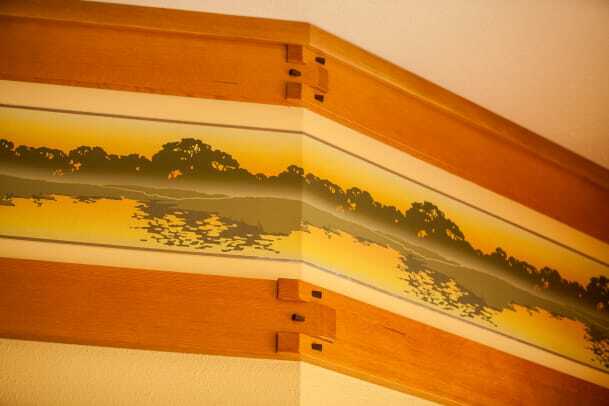 Re-issued Stickley furniture has Harvey Ellis-designed inlays. Note the decorative scarf joint in the cornice moulding. The couple had been collecting books on Arts & Crafts architecture since 2001—which currently fill the library at the foot of the impressive, mixed-wood staircase inspired by a visit to the Gamble House in Pasadena, designed by architects Greene & Greene in 1908 as a vacation home for David Gamble, the president of Procter & Gamble. 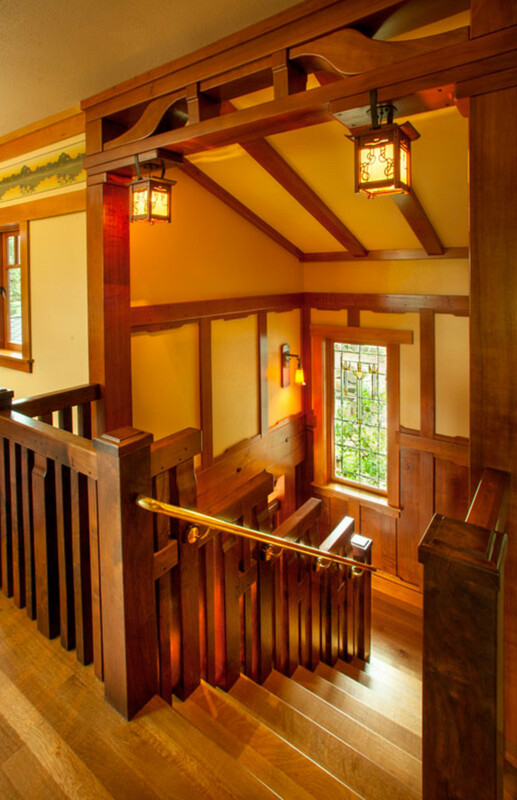 “The Gamble House lit our fire,” says Brian, who grew up in a 1920 Dallas Arts & Crafts house. But the Duncan–Irwin and Robert A. Blacker houses in Pasadena solidified their design for the interior. With its shingling and large overhangs, the Wilbur Reid House in Portland inspired the new exterior. Old California fashioned the dining-room chandelier after an original in Pasadena’s Duncan–Irwin House. An original copy of Henry L. Wilson’s The Bungalow Book of 1910 inspired the front façade. Wilson describes a popular California Bungalow with its porte-cochere columns covered in stucco. 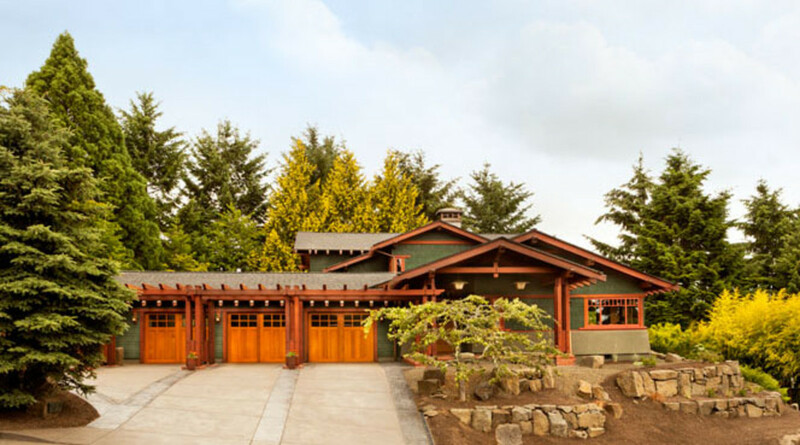 The Daltons adapted the idea to create a pergola, a set of striking trellises here made of salvaged old-growth coast redwood, which screens those pesky front-facing garages. Finding someone to design and build the house was a journey in itself. “Our vision for the house required us to cast a wide net to find the talent needed to create it,” says Brian. Benefitting the Daltons, the market had dipped by 2010, and they were able to work with such top-notch professionals as Karl Anderson of Anderson Shirley Architects in Salem, project manager Dave Butterfield of Broad Reach Construction in Portland, and Eric Lichtenthaler of Bear Creek Construction of Corbett, who co-managed the project. Bradbury’s ‘Land’s End’ frieze heads the foyer. Construction work began in July 2011, with the gutting of the small house and expansion of its footprint in all four directions, plus up a storey to create the airplane bungalow configuration. By January 2012, the roof was on—and Dave was camping out in the garage. 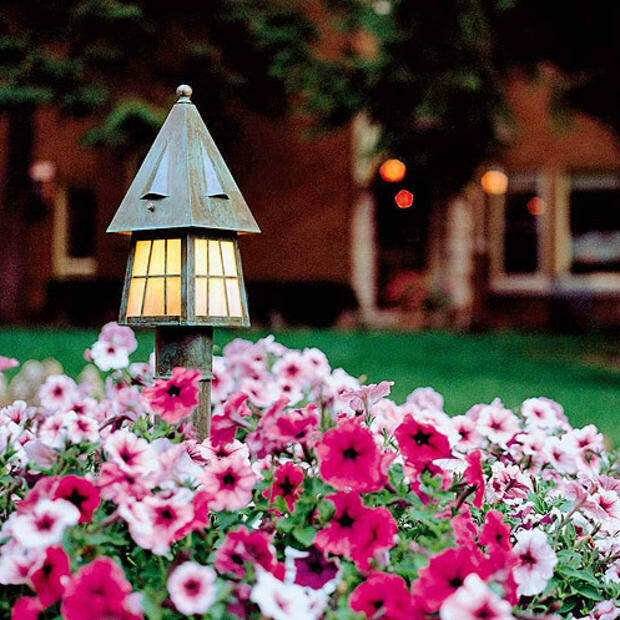 “Our electric bill for one winter month was $1,700,” recalls Carol. The couple moved in eight months later, while the house was still under construction. “It turned out better for us to take part in the construction than to write a large builder a check. This was a visceral journey. And it didn’t destroy our marriage,” Brian chuckles. Three different tile companies contributed: Mission Guild in New York created the triptych in the fireplace surround; Pewabic Pottery, a 111-year old company in Detroit, crafted the fireplace field tiles. North Prairie Tileworks of Minnesota made the kitchen backsplash tiles. 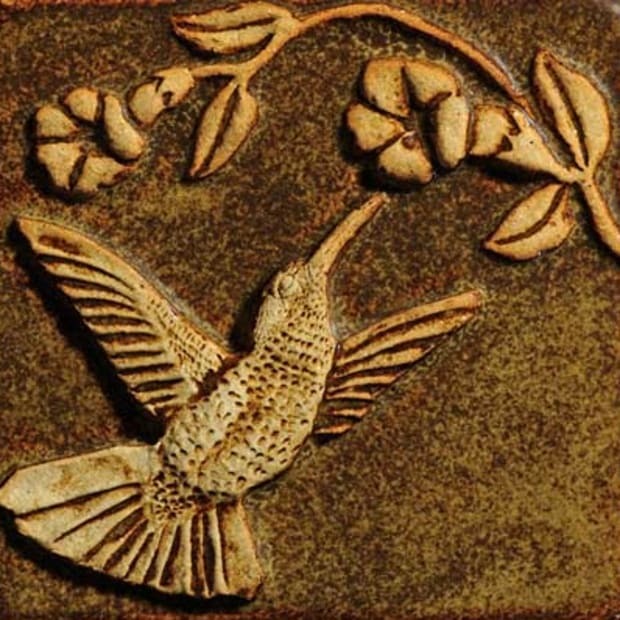 “It was a challenge,” Brian admits, “to coordinate the handcrafted work of Mission Guild and Pewabic” in one project. “They sent samples,” Carol says, “but Brian spoke to them on the phone a lot, and the two companies needed to talk directly to each other to be sure the field and deco tiles would work together.” Handcrafted hoods for the fireplace and kitchen range show another collaboration of fine artisans. 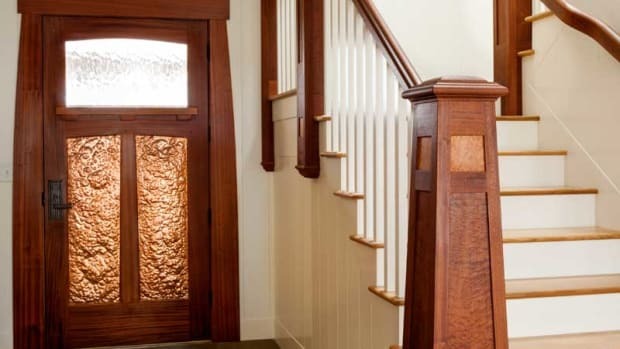 James Homola of Northwestern Sheet Metal created the hammered copper hoods (along with exterior copperwork), while Dallas neighbor Don Thompson of 2 Creative Forge did the ironwork. 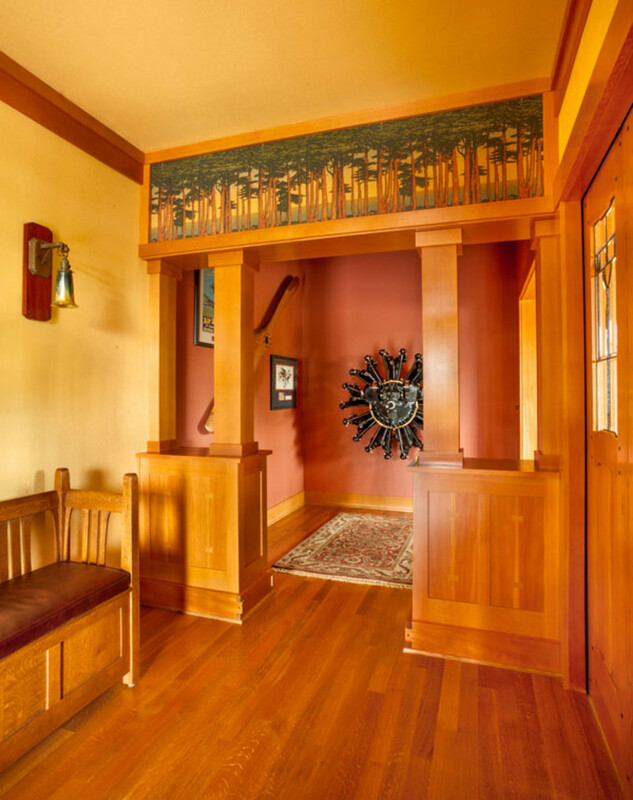 Brian worked with Eric Lichtenthaler to design the custom entry door, which was built by Scott Roeder in Portland. 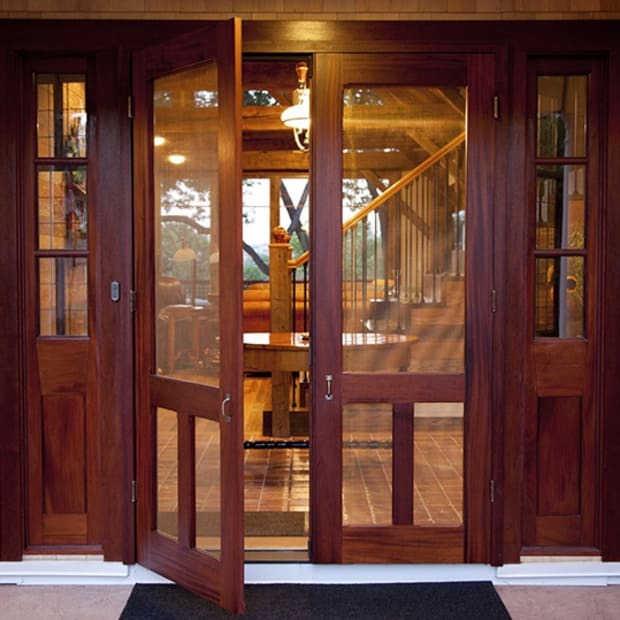 Interior doors are by Portland’s Willow Classic Woodworking. 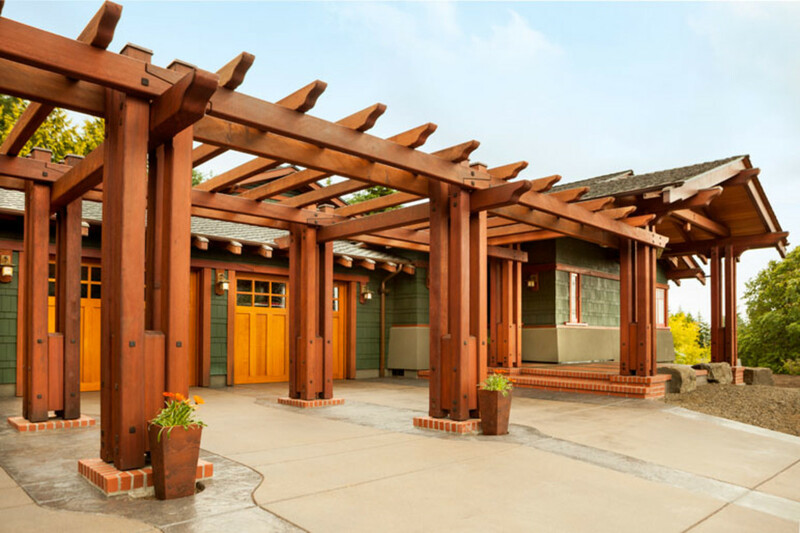 A series of redwood trellises creates a period-style pergola to screen the garage, which has new doors of cedar. Even the design for the 141 rafter tails was tested among the group. “We mocked up various shapes, then presented them to six people who voted for their favorite,” Brian says. “The team members were all educating themselves as they went along,” Brian explains, “talking about the ‘language’ of the place, attending an in-depth Gamble House tour for carpenters, and so on. We agonized over every detail because we didn’t want to copy things slavishly or commit outright plagiarism. When we designed an element, we scaled it up or down, making mockups along the way. In the end, we wanted each room to have its own personality,” not necessarily repeating exact windows, woodwork details, carpets, etc. The radial aircraft engine is from the replica of Lindbergh’s Spirit of St. Louis, used in the Jimmy Stewart movie. A 1917 Army Air Service Signal Corps propeller hangs at the left. In case you missed it, the entry foyer’s 1927 Wright Whirlwind J-5 radial engine, the same type that powered Lindbergh’s original Spirit of St. Louis, pays homage to another pastime this creative couple enjoys: taking one of their vintage bi-planes up for a spin. A cozy breakfast nook is right out of the bungalow period. The mica-shade chandelier from Rejuvenation echoes the pendants by Mica Lamp Co. over the island. 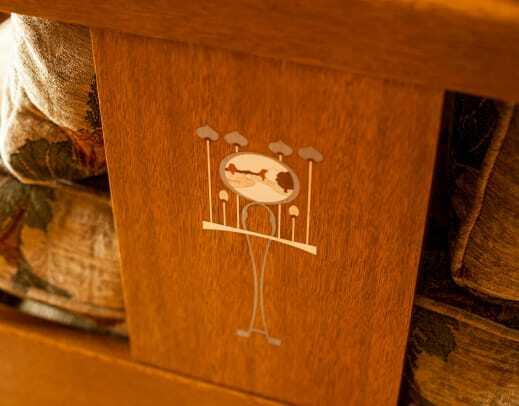 The cabinets feature pegs handcrafted from black walnut; these were fitted into square holes to hide screw heads. Forged, antiqued brass hardware adds to the Arts & Crafts look. 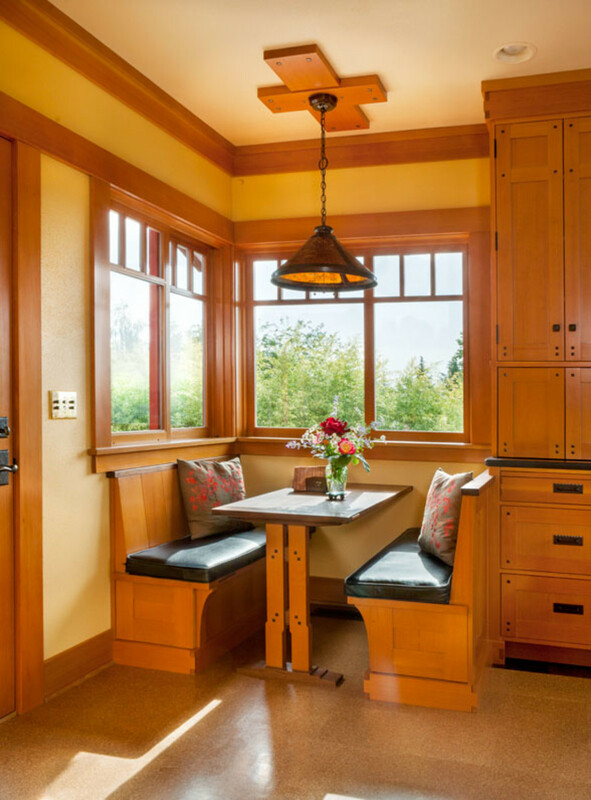 A built-in breakfast nook with benches and a trestle-style table is also made of old-growth Douglas fir. North Prairie Tileworks created the decorative backsplash. Banks of cabinets create a pantry that looks like furniture. 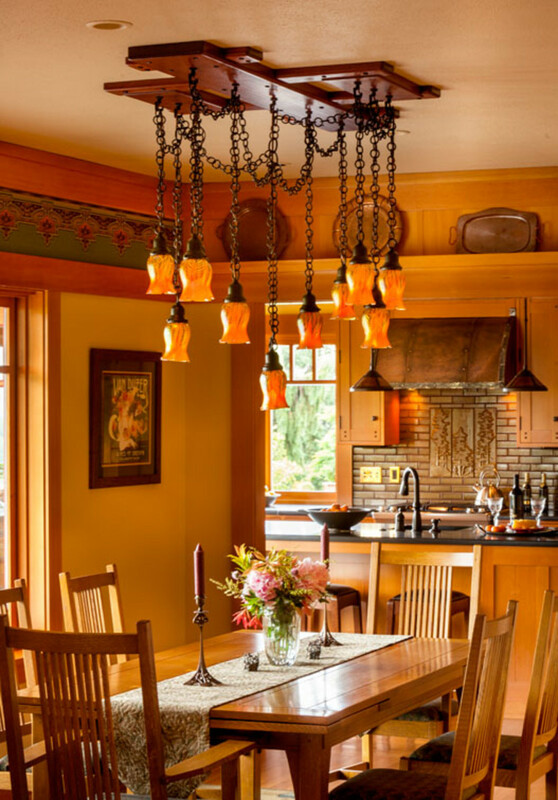 Bear Creek’s Eric Lichtenthaler made several mockups of the wood structure from which a trio of mica-shade pendant lamps hangs over the kitchen island. Carol helped design a unique towel rack in front of the hammered-copper sink. 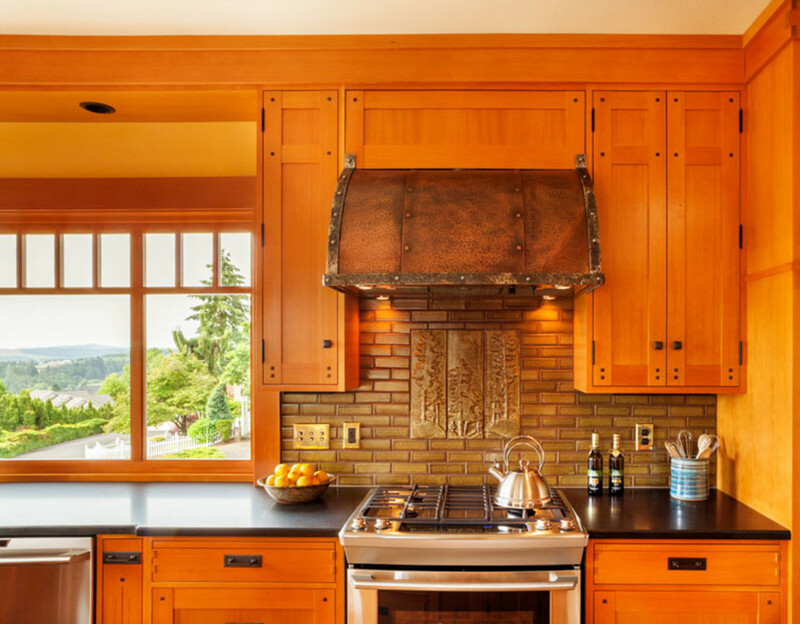 The backsplash was created by North Prairie Tileworks; the tiles play beautifully off the handcrafted stove hood of hammered copper with forged-iron trim. Pleasingly understated design and fine woodworking belie the expert engineering that went into this new house on the Oregon coast. 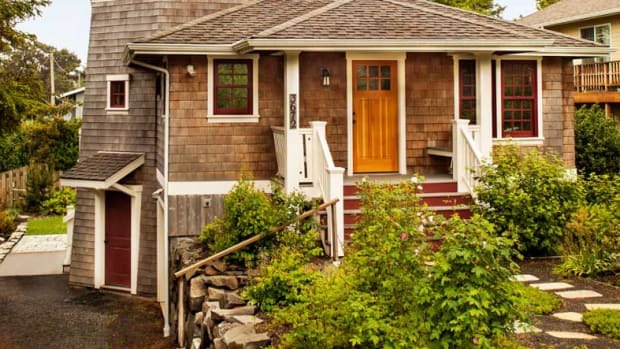 A whimsical beach cabin, stalwartly built, is cozy and casual with arts & crafts-inspired details. 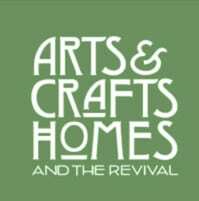 Along the rugged Oregon coast, a house grows out of the boulders: new work in the Arts & Crafts spirit, led by a woodworker turned builder.